OTC Treatment for acne depends upon kind of the acne you are suffering from and its severity. OTC Acne treatment may take several months before it starts showing any visible improvement. In case of having not severe acne, such as having a few blackheads, whiteheads and spots, over-the-counter creams or gels (OTC topical treatments) that contain benzoyl peroxide can treat them successfully. However, you will need to visit a dermatologist, if the acne is severe (like suffering from large number of papules and pustules or painful nodules) or when widespread. In such cases your doctor may prescribe medication. 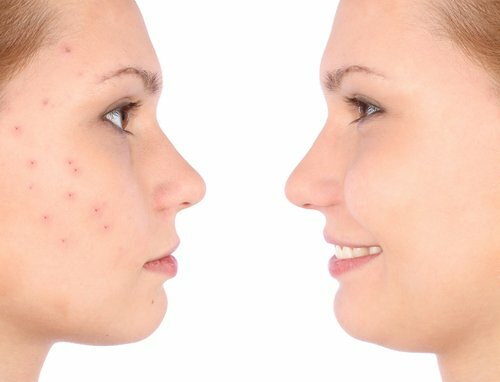 In this article, you will find information about various over-the-counter acne products, what will work for you and why and how to use them for best results? These over-the-counter (OTC) acne products can treat mild to moderate acne or periodic breakouts successfully. They come in the forms of cleansing lotions, gels, foams and towelettes, leave-on products, and treatments or kits. How To Know Which One Will Work Best For You? Before we tell you how OTC acne products work and what ingredients to look for, we advise you to follow a gentle skin care regimen to prevent and treat and acne. Acne products act in different ways, depending on what active ingredients they contain. Some products act by exterminating bacteria that cause acne inflammation. Some remove excess oil from the skin and/or accelerate removal of dead skin cells and formation of new skin cells. Others do a combination of these things. Here are common active ingredients contained in OTC acne products and how they act to treat acne. (i) OTC Benzoyl Peroxide. This ingredient works as an antiseptic to reduce the number of on the skin surface hat cause acne, helps remove excess oil from the skin and gets rid of dead skin cells, which can otherwise block pores. It also helps to reduce the number of whiteheads and blackheads, and has an anti-inflammatory effect. Over The Counter benzoyl peroxide products are usually available as creams or gel in strengths ranging from 2.5 to 10 percent. You can apply it once or twice a day. It should be used 20 minutes after washing to all of the parts of your face affected by acne. Common side effects can be dry skin, scaling, redness, burning, itching and stinging sensation, particularly if you have sensitive skin. Side effects are usually mild and should pass once the treatment has finished. Take care while using benzoyl peroxide because it can bleach hair and clothing. Use it sparingly, as too much can irritate your skin. It also makes your face more sensitive to sunlight, so avoid too much sun and ultraviolet (UV) light, or wear sun cream. Benzoyl peroxide can have a bleaching effect, so avoid getting it on your hair or clothes. Most people need a six-week course of treatment to clear most or all of their acne. You may be advised to continue treatment less frequently to prevent acne returning. (ii) OTC Salicylic Acid (Also Known As Beta Hydroxy Acid). This ingredient works by exfoliating (removing) the layer of dead skin cells on the skin surface, thereby helps prevent skin pores from getting clogged. Over the counter salicylic acid products are available in washes, creams, facial scrubs, cleansing cloths and cleansing pads ranging in strengths from 0.5 to 5 percent. Possible side effects can be mild stinging and skin irritation. Tip: These products can be used together with benzoyl peroxide to fight acne, but in some cases this combination can make the skin dry and irritated. (iii) OTC Sulfur Acne Products: Sulfur helps in getting rid of dead skin cells that otherwise can block skin pores and also helps in removing excess oil. It works by suppressing the bacteria that causes acne and also can unclog pores. Sulfur products are available as leave-on acne products, such as spot treatments. It’s generally combined with other ingredients, such as salicylic acid, benzoyl peroxide or resorcinol. Possible side effects are dry skin. And some products have an unpleasant odor. Tip: Over the counter sulfur products can be used as very targeted treatment and are intended to be applied to a single pimple rather than covering a large area of acne. There are some supporting ingredients that can be used in conjunction with to improve the functioning of OTC acne fighting ingredients. While these inactive ingredients may not treat the root cause of acne, but they surely can provide extra benefits to the skin that allow active ingredients to work more effectively. (iv) Alpha Hydroxy Acids (AHAs): Two types of alpha hydroxy acids are available under nonprescription category acne products, namely, glycolic acid and lactic acid. Alpha hydroxy acids are synthetic version type, which are obtained from sugar-containing fruits. They are widely available in the forms of cleansers, creams, lotions and in cleansing cloths. They work similar to salicylic acid by exfoliating the skin and treat acne by removing dead skin cells and reducing inflammation. Alpha hydroxy acids also promote growth of new, smoother skin. These further reduce appearance of the acne scars and makes the skin pores look smaller. They can be used twice a day, but some patients find this too drying for their skin. (v) OTC Retinol Products: They are derived from vitamin A and work by unclogging pores and making skin appear brighter (more radiant). They are available as OTC leave-on acne products and by prescription. Often found in anti-aging products that also can help acne in older adults. The possible side effects can be drying of skin, so patients should be careful using this ingredient, especially in combination with other OTC ingredients. (i) Start With Benzoyl Peroxide: Initially when you are not sure about which OTC acne product to use, it’s safe to start with one that contains benzoyl peroxide. It’s effective and well tolerated by most people. You need to have patience and allow it enough time to show result. Read product labels carefully to see the type and amount of its active ingredient. Start with lower strength (2.5%) as it will have fewer side effects, but work as good as those with stronger concentrations. (ii) Begin With Lower Strength Acne Products. Lower strength OTC acne products are likely to minimize redness, dry skin and other skin problems. If needed and when you feel comfortable gradually increase strength of the product and how often you use the product. This will help your skin adjusting to the treatment slowly. (iii) Use Products Having Different Active Ingredients To Treat Stubborn Acne: Acne ingredients act in different ways. You need to try a product with different active ingredient, if the one you are using is not giving good results. Also experiment with applying one product in the morning and a different one at night to prevent skin irritation. (iv) Be Patient: Treating acne with acne products can take time, so you need to have patience. It can take 2-3 months of regular use daily of an acne product to show results. And be prepared, acne may look worse for some time before it gets better. (v) Experiment To Find Out What Works: You may have to vary products having different active ingredients before you find out what works best for you. Caution: If your acne doesn’t improve after 2-3 months of OTC products treatment at home, we suggest you speak to a dermatologist, who may prescribe acne products of higher strength and medication.